US$ 1050 / person ? 1 Arrival to Paro, drive to Thimphu Arrival by plane to Paro airport and drive to Thimphu or in case of arrival by land, crossing border from India in Phuntsholing/Jaigon and full day drive to Thimphu. Stop at Tachog lhakhang to see traditional bridge made using ancient iron chains. Evening Visit of Tashicho dzong, the castle, which serves as seat of the king and government. Other sightseeing depending on arrival time. 2 Thimphu, hiking Early morning hike to Dodedra shedra. Start at Dechencholing part of Thimphu and gently climb some 500 meters up, with beautiful views of Thimphu town. Dodedra is monastery school set in pristine environment away from the hustle and bustle of the town. Visit main temple with original mural paintings and small museum. Descend back to Thimphu for lunch. Then drive to Buddha Dordenma, the gigantic statue of Buddha overlooking the valley and short walk to striking city viewpoint. See Memorial Chorten, always busy with devotees. Walk in Norzin lam street and see the traffic police signaling in junctions. Thimphu is only capital in the world without the traffic lights. Finish walk at handicraft market where many interesting Bhutanese souvenirs can be seen and bought for reasonable price. Evening in leisure. 3 Thimphu, hiking in Dochu-la, drive to Paro Hike down from the monastery and drive to Dochu-la pass with interesting 108 stupas and royal Chapel dedicated to Bhutan’s 4th king. Form pass we will start 4-5 hours round hike to the Lungchusey gompa with 360° mountains panorama viewpoint. Descend to Tashigang gompa and reaching back to road in Hontsho. Drive to Paro. Pay a visit to National Museum of Bhutan with various exhibitions and conclude sightseeing in Paro dzong, the castle where Bernardo Bertolucci’s Little Buddha film was shot. 4 Trek Paro – Bumdrak Trek 6 km, 5-6 hours, ↗960m. In the morning we will drive to Sang Choekor Buddhist college at 2890 meters. First 3-4 hours are spent by steep climb in the forest. Lunch will be served at small temple of Chechemhen in 3640m with nice views of Paro valley. After short final climb,the trail will get gentle, ascending slowly up. Finally to reach fixed luxurious camp below the Bumdrak temple. Temple is dubbed a Cave of Hundred thousand Dakinis, the Buddhist female angels, who allegedly built it in 17th century. If caretaker is present you can also visit the temples. If you still have spare energy and time, you can continue climb to 4130 meters high viewpoint for better panoramic views and spotting of holy Jomolhari peak (7326m) summit. Round trip to viewpoint takes about 1.5 hours. Camp in Bumdrak has offers large fixed tents with beds and warm blankets. Dining tent is equipped with gas heaters. Toilet tent and camping berths and chairs are here too, so no worry this night will be almost as comfortable as if you're in hotel. Watch for beautiful Himalayan monals which lives in nearby bushes and frequently comes to peck food leftovers to kitchen tent. 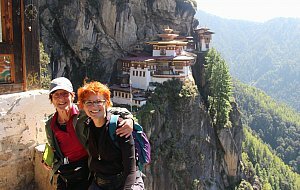 5 Trek Bumdrak – Tiger’s Nest – Paro Trek 10 km, 6 hours, ↗180m, ↘1400m. Today we will start directly down to the forest, constantly descending. After some two hours we will reach to Oselgang monastery where the views to Paro valley starts to open. Continue down, reaching to Ogyen Tsemo templ, right above the Tiger Nest (not yet visible). Finally descend to narrow valley and short climb to Zangto Pelri lhakhang on the top of the cliff. From here you can glimpse the roofs of the Tiger’s Nest monastery to which you will soon start descending. Tiger's Nest, is most holy place in Bhutan. It was built in 17th century on the place where Guru Padmasambhava, 8th century magician saint meditated. After visiting the temple, descend to the parking. Before going back to hotel we will still spend a time to visit the ruins of Drukyel dzong, mighty castle which protected Bhutan against Tibetan intrusions and Kiychu lhakhang, one of two oldest temples in Bhutan built in 7th century by warrior-king Songtsen Gampo of Tibet. Enjoy the last evening in Bhutan. 6 Departure Departure from Bhutan by flight or drop to Indian border in Jaigon/Phuentsholing. 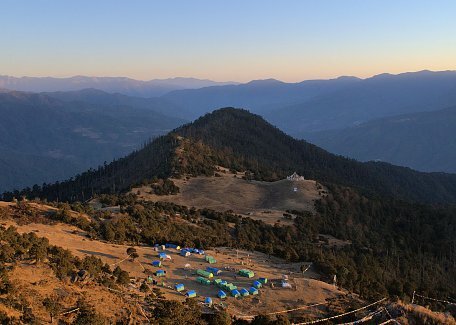 Just trek and go (-1 or -2 days): If you are in hurry you can just briefly visit Thimphu on day 4 and then leave or even you can omit totally Thimphu and depart after the trek on day 4. Extend sightseeing to Wangdue and Punakha (+1 day): If you have another spare day, why not to include Wangdue and Punakha with it famous monumetns like Chimmy lhakhang and Punakha dzong. You can also do rafting there if interested. On the first day our guide told us" I feel happy if you are happy" and he told really the truth!